Designation: Department of Anesthesia, ICU and Pain Relief, South Egypt Cancer Institute, Assiut University. List of Author(s): Elzohry AAM, Foli AME. Copyright: © 2018 Elzohry AAM. This is an open-access article distributed under the terms of the Creative Commons Attribution License, which permits unrestricted use, distribution, and reproduction in any medium, provided the original author and source are credited. Introduction and objectivesAcute pain is an important fear for most patients and influences their recovery and overall experience. Poorly treated, it could lead to undesirable effects and patient dissatisfaction. Hence, it is important to understand, assess and treat acute pain effectively. Pain management has been transferred from intraoperative into perioperative period throughout the emergence of modern anesthesiology. Pain management in postoperative period is one of the most essential components of sufficient post-surgical patients care. The objective of this review is to define and demonstrate the risks and different sequela of acute postoperative pain. General anesthesia, Regional anesthesia, Acute postoperative pain, Upper abdominal surgery. Ronald Melzack said that “By any reasonable code, freedom from pain should be a basic human right, limited only by our knowledge to achieve it”. It is the basic duty of all healthcare professionals to relieve pain, and the most important indication for treating pain after surgery is humanitarian . Acute pain is an important fear for most patients and influences their recovery and overall experience. Poorly treated, it could lead to undesirable effects and patient dissatisfaction. Hence, it is important to understand, assess and treat acute pain effectively . Pain may be classified according to its presumed etiology; nociceptive pain is due to the stimulation of nociceptors by noxious stimuli and neuropathic pain is the result of dysfunction of the nervous system. Pain may also be classified into somatic and visceral pain. An alternative classification is based on duration . Acute pain is defined as ‘pain of recent onset and probable limited duration. It usually has an identifiable temporal and causal relationship to injury or disease’. The point at which acute pain becomes chronic has been suggested at about 12 weeks or when the pain is no longer thought to be due to the initial insult . Pain associated with any surgery can be divided into somatic pain and visceral pain. Therefore, when performing epidural analgesia for abdominal surgeries, both the abdominal wall innervations and the afferent visceral innervations, must be targeted to provide optimal analgesia. The innervations of the abdominal wall has a segmental dermatomal distribution and is supplied by the anterior and lateral cutaneous branches of the ventral rami of the seventh to twelfth intercostal nerves (T7-12) . The ability of the somatosensory system to detect noxious and potentially tissue-damaging stimuli is an important protective mechanism that involves multiple interacting peripheral and central mechanisms. The neural processes underlying the encoding and processing of noxious stimuli are defined as ‘nociception’ . In addition to these sensory effects, the perception and subjective experience of ’pain’ is multi factorial and will be influenced by psychological and environmental factors in every individual. Acute pain perception begins with activation of specific sensory nerves, termed nociceptors. These are unencapsulated free nerve endings that are present in the skin, deep somatic tissue and viscera. Providing the stimulus is suitably intense, high threshold nociceptors will still activate in the absence of actual tissue damage. Nociceptors are probably activated by mechanical distortion of the nerve leading to an increase in H+ and K+ concentration. Nociceptors can be divided into two main classes; A-delta and C fibers. The main properties of these fibres are summarized in the Table 1 below . Table 1: Classification and properties of neurons. Multiple tracts and centers exist within the central nervous systems which are responsible for the transmission, modulation and perception of noxious stimuli. It is important to realize that these areas should not be considered as fixed or functioning in isolation. Rather, they are subject to change from both descending and ascending pathways and can alter or expand their connections to interact with adjacent nerves . Cell bodies of afferent nerves lie in the DRG with fibres synapsing in the dorsal horn of the spinal cord. The output from the dorsal horn is however dependent on other neuronal input to the synapse. 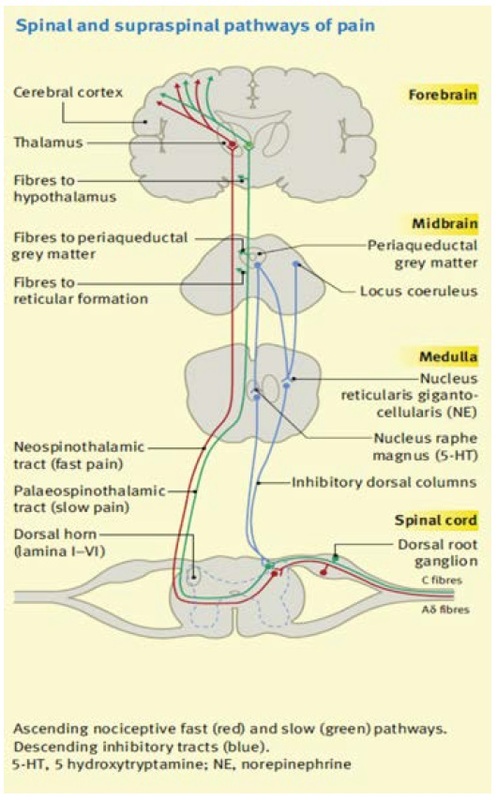 Afferent neurons may divide prior to entering the cord and send branches cephalic or caudal in the longitudinal tract of Lissauer before synapsing with dorsal horn neurons. The result of this being that a single C-fiber afferent may be responsible for innervating dorsal horn neurons at multiple spinal levels . The grey matter of the spinal cord can be divided into ten physiologically and histological distinct layers known as rexed lamina. 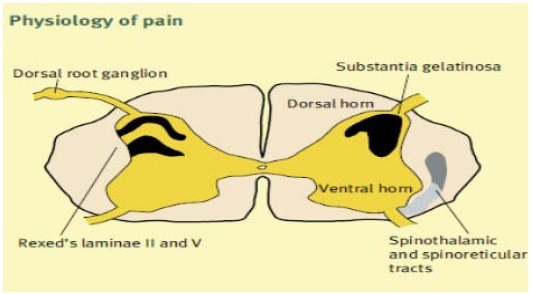 Laminae 1 to 6 and 10 are the sites that sensory nerves synapse with dorsal horn cells and are important in pain transmission. Laminas 7-9 are involved with motor function Figure 1 . Spinal and Supra spinal pathways of Pain. Figure 1: Spinal and Supra spinal pathways of Pain. The ability of the somatosensory system to detect noxious and potentially tissue-damaging stimuli is an important protective mechanism that involves multiple interacting peripheral and central mechanisms. The detection of noxious stimuli requires activation of peripheral sensory organs (nociceptors) and transduction into action potentials for conduction to the central nervous system. Nociceptors are stimulated by chemical, thermal or mechanical damage and trigger the nociceptive impulses . Nociceptive primary afferents are widely distributed throughout the body (skin, muscle, joints, viscera, meninges) and comprise both lightly myelinated A-delta fibers (diameter 2-5 mm) and slow-conducting unmyelinated C-fibers (diameter <2 mm). These fibers enter the dorsal horn of the spinal cord and synapse at different sites (Aδ at laminae II and V, C at laminae II). The substantia gelatinosa (lamina II) integrates these inputs and second-order neurons form the ascending spinothalamic and spinoreticular pathways on the contralateral side, Figure 2 . Figure 2: Physiology of pain. The larger AB fibres conducting “touch” and descending pathways stimulate inhibitory interneurons within the substantia gelatinosa and inhibit C fibre nociceptive inputs. This is the basis of the gate theory of pain. Pain may be modified by altering the neural pathway from its origin at the nociceptor to its interpretation within the central nervous system by various agents. Psychological factors that influence the experience of pain include the processes of attention, other cognitive processes (e.g. memory/ learning, thought processing, beliefs and mood), behavioural responses, and interactions with the person’s environment . Pain should be assessed within a bio psychosocial model that recognizes that physiological, psychological and environmental factors influence the overall pain experience. The assessment of acute pain should include a thorough general medical history and physical examination, a specific ‘pain history’ and an evaluation of associated functional impairment along with any side effects of treatment. In acute pain management, assessment must be undertaken at appropriately frequent intervals . Sometimes associated factors such as hyperalgesia, the stress response (e.g. plasma cortisol concentrations), behavioural responses (e.g. facial expression), functional impairment (e.g. coughing, ambulation) or physiological responses (e.g. changes in heart rate) may provide additional information . The assessment of acute pain should include a thorough general medical history and physical examination, a specific ‘pain history’ and an evaluation of associated functional impairment. In acute pain management, assessment must be undertaken at appropriately frequent intervals. At these times, evaluation of pain intensity, functional impact, and side effects of treatment must be undertaken and recorded using tools and scales that are consistent, valid and reliable . The well-known visual analogue scale (VAS) and numeric rating scale (NRS) for assessment of pain intensity agree well and are equally sensitive in assessing acute pain after surgery, and they are both superior to a four-point verbal categorical rating scale (VRS). They may be used for worst, least, or average pain over the last 24 h, or during the last week . Assessment of pain immediately after surgery can be more difficult and lead to greater inter patient variability in pain scores because of transient anesthetic-related cognitive impairment and decreases in visual acuity. (Machata et al., 2009) Figure 3. Commonly used one-dimensional pain intensity scales: the 11-point NRS, the VAS from no pain  to worst pain imaginable  and the four-point categorical verbal rating scale (VRS). 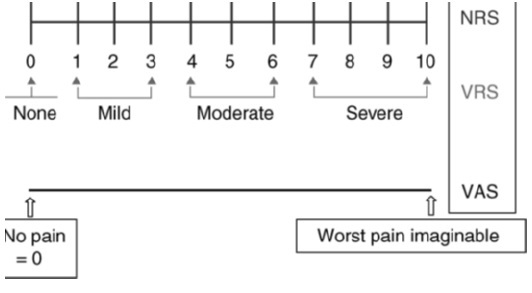 Figure 3: Commonly used one-dimensional pain intensity scales: the 11-point NRS, the VAS from no pain  to worst pain imaginable  and the four-point categorical verbal rating scale (VRS). Clinically significant injury such as surgeries responses can lead to a range of physiological effects which may lead to adverse clinical effects. Patients at greatest risk of adverse outcomes from unrelieved acute pain include very young or elderly patients, those with concurrent medical illnesses and those undergoing major surgery . Sustained acute nociceptive input, as occurs after surgery, can also have a major influence on psychological function, which may in turn alter pain perception. Failure to relieve acute pain may result in increasing anxiety, inability to sleep, demoralization, a feeling of helplessness, loss of control, inability to think and interact with others -in the most extreme situations, where patients can no longer communicate, effectively they have lost their autonomy . Aggressive perioperative pain prevention can yield both short-term and long-term benefits as unrelieved pain affects patient recovery, prolongs hospital stays, increases hospital morbidity, and adds to the burden of growing healthcare costs. In total, there are many important reasons for aggressive acute pain management . Postoperative pain is considered a form of acute pain secondary to surgical trauma and is associated with an inflammatory reaction and subsequent pathway of afferent neuronal signals. 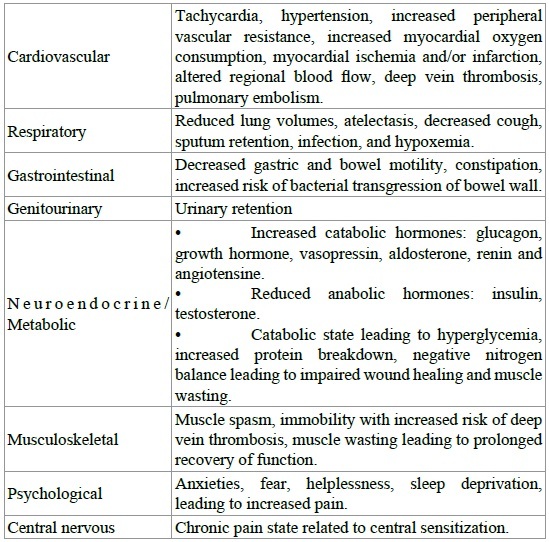 Acute postoperative pain is associated with autonomic, endocrine-metabolic, physiological, and behavioural responses summarized in following Table 2 . Table 2: Effects of surgery, including local and systemic inflammatory responses and mediated responses. Acute surgical pain causes a global sympathetic response capable of increasing heart rate, peripheral vascular resistance, blood pressure, and subsequently cardiac output. This sympathetic cascade can increase the oxygen demand of the myocardium and potentiate myocardial ischemia, especially in patients with preexisting coronary artery disease Table 3 . Table 3: Adverse effects of undertreated acute pain. Acute pain has also been found to decrease limb blood flow by directing blood away from skin and viscera and toward vital organs. This decrease in extremity blood flow may impair wound healing and increase muscle spasm. Postoperative pain may also reduce patient mobility, promoting venous stasis. Increases in fibrinogen and platelet activation related to surgical trauma will increase blood coagulability. These factors together increase the risk of venous thromboembolism . Data suggest that “the use of epidural anesthesia in the perioperative period results in less platelet activation and significantly better fibrinolytic function” thereby resulting in significant protection against Thromboembolic complications. This protection also may be related to the systemic effect of local anesthetics, which have been shown to have an antithrombotic effect . Perioperative cardiovascular adverse events may result in considerably prolonged postoperative stay. Cardiovascular events warranting unanticipated hospital admissions are infrequent. Cardiovascular events occur with higher frequency among patients with pre-existing cardiovascular diseases (e.g. hypertension, congestive heart failure). Increasing age is also associated with higher incidence of cardiovascular conditions among elderly patients . All of these techniques have benefits and risks (advantage and disadvantage) Patient control analgesia (PCA) is one of the most common techniques for postoperative pain management. This device is under patient control intermittently or continuously, and infuses IV opioids or non- opioids. The use of intravenous opiates is still limited because of side effects such as respiratory depression . The administration of analgesia before surgery (preemptively) may be effective in reducing the postoperative pain from surgery by preventing the peripheral and central sensitization caused initially by surgical incision and later by inflammatory injury. There are studies that support the effectiveness of pre-emptive analgesia. However, other studies concluded that there was a lack of evidence for preemptive treatment with NSAlD’s, intravenous opioids, and ketamine, peripheral local anesthetics, and caudal analgesia . The effectiveness of preemptive analgesia is likely to remain a controversial issue for some time. Despite this, the preoperative administration of non-opioid analgesia, such as NSAlDs, ketamine, and local anesthetics, prior to surgical incision is an important component in reducing postoperative pain scores and analgesic requirements in the first 24 h after discharge . Regional anesthesia and analgesia can be used to significantly reduce postoperative pain scores and spare the use of systemic opioids. Regional anesthesia can be performed at the neuraxis (epidural and intrathecal), the nerve root (paravertebral), and the peripheral nerve (transversus abdominis plane) level. Local anesthetic deposition at these sites will selectively block nerve conduction and result in different analgesic and side effect profiles . Acute postoperative pain is multifactorial with complicated Pathophysiology, but careful history and good assessment lead to ideal selection of treatment plane either medications or interventions according to operation performed. Interventional methods are favourable due to many reasons; avoiding chronic pain and decreased side effects of systematic medications as opioids.